London, National Gallery, no. 932. Poplar panel, 96.8 x 76.2. PROVENANCE (from Gould, 1975): London, Christie’s, Louis Philippe sale, 6 May 1853, lot 81, as Sebastiano del Piombo, bought by Pearce. Wynn Ellis Bequest, 1876. Franklin, “Portrait,” 1989, 839-840, and 1994, 215, 291, n. 22, stated that in 1838 the picture was in Louis Philippe’s Spanish Gallery in the Louvre and that it can be assumed that it came from Spain in the mid 1830s (Notice des tableaux de la Galerie espagnole exposés dans les salles du Musée Royal au Louvre, Paris, 1838, 112, no. 438, and the introduction to the French edition of the catalogue of the king’s pictures at the sale, Christie’s, 6 May 1853). On the poor condition of this picture, see below, Gould, 1975; Franklin, “Portrait,” 1989; and Franklin, 1994. National Gallery Illustrations. Italian Schools, London, 1937, 176, as Italian School, Sixteenth Century. 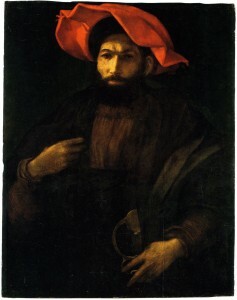 Gould, 1975, Florentine School (formerly Italian School, XVI century), by “some sub-Sarto painter… immediately before the Mannerist phase,” and from the costume, around 1520; Gould reported that a verbal attribution to Rosso had been made by F. Zeri. Federico Zeri, “Un’ipotesi per il Rosso Fiorentino,” Diario di Lavoro 2, Turin, 1976, 88-91, Fig. 90, as perhaps by Rosso, around 1525 in Rome. Franklin, “Portrait,” 1989, with Color Pl., as Rosso, in the early 1520s. Ciardi and Mugnaini, 1991, 24, 82-83, no. 12, with Color Pl., as Rosso, 1518-1525. Franklin, 1994, 215-216, 221, 219, Color Pl. 192, as by Rosso, early 1520s and not much after 1522 or so. I remain perplexed that this portrait was ever attributed to Rosso. The whole conception of the image, with the figure and his costume so largely defined in relation to receding space and so little in relation to the picture plane, is wholly unlike Rosso’s manner of pictorial composition and design. There is no analogy in Rosso’s art for the definition of the figure’s hat set like a large sculptural form around and above the head. The chiaroscural continuousness of the image is also wholly unlike anything found in Rosso’s art. It is interesting that the picture was once attributed to Sebastiano del Piombo, and that Zeri saw in it the influence of his art and of Michelangelo’s. Zeri also thought it was done in Rome. I do not think the picture is Florentine. It brings to mind Polidoro da Caravaggio.